I can be very impatient. Driving behind a slow or erratic driver, I start telling them what to do — “Drive with a purpose!” Even when I am not in a hurry, I get annoyed. When someone races past and then cuts me off, it’s even worse. I call the other driver harsh (unprintable) names and feel angry at how that driver endangers the rest of us. Then I think about the Cherokee wolf story: that there are two wolves within every one of us, one evil and the other good, and that they are constantly fighting to take over. Who will win the fight? The wolf we feed. So I start to feed the kind wolf. I start imagining all the different reasons for the behavior of the driver who’s annoyed me. Maybe he’s sick. Maybe she’s exhausted. Maybe he’s grieving a death. Maybe she’s recovering from surgery. Maybe he’s worried about his wife. Maybe she’s anxious about her son. Maybe he’s late for an appointment that is going to change his life. Maybe she’s racing to get to the hospital. The minute I choose to cut the other driver some slack, I begin to relax. Instead of assuming mean things (he’s a jerk, she’s an idiot), I assume kind things (she’s in trouble, he’s suffering), and my whole attitude changes. I give them room, physically and emotionally. I allow that there is some reason for their behavior, and that I do not know what it really is. It might be something stupid or foolish, but it might be something I would understand and sympathize with. Even if their reason seems foolish to me, it may be vital to them. Giving others the room to do what they need to in the moment without judging them for their choice allows me to let go of any anger or resentment I might feel. 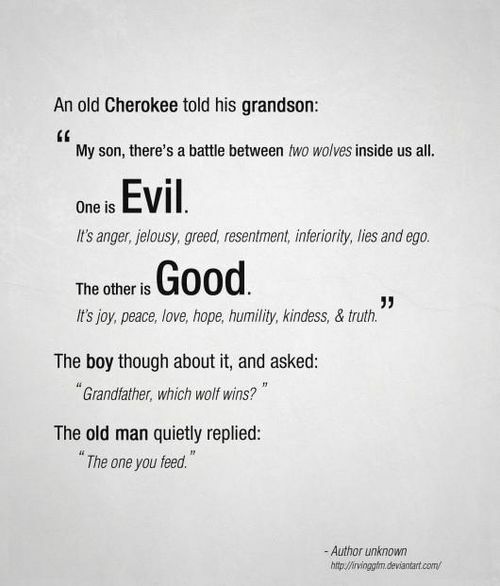 I stop feeding the evil wolf and start feeding the good one, and I feel better. Do you struggle to feed the right wolf? How do you go about it? 🙂 good reminder…I try to be the good wolf when a service person/customer service person /salesclerk gives me bad service. I learned from my husband who was in customer service for decades that you just don’t know what might have occurred in their life right before they interacted with you. It doesn’t make it right but we don’t know if they received and upsetting phone call had something happen before work or at work that change their attitude and behavior. I just assume my butcher has a sore back and that is why he can’t smile. But he does do what he’s there to do and I need to appreciate that. Thanks Kit…I will probably need to remember this a few times more today! That’s a great example, Emmy! Staying civil with customer service can be a challenge (Big Name Airline, I’m looking at you!) A great time to practice this technique. I remember all the times I haven’t been perfect and realized that I wanted someone to give me a break. For me, it has come down to being selfish. If I am selfish, I want what I want when I want it. When I am giving and unselfish, I look for the good in others and help them to get whatever they need/want. I’m by no means perfect at this and get upset more than I should. Last night as I was driving home after putting in two hours of overtime, I had a near miss with an eighteen wheeler driving too fast on an off ramp from the interstate. I told myself you are alive, you are not sitting with a damaged car by the side of the road, you do not have to spend tomorrow on the phone with your insurance company. You are going home to a warm house and dinner prepared by Peter. You are lucky. Focusing on what I had that was good rather than the other driver helped me stay calm. Glad to hear you are OK! And you are right: focusing on the positive can also keep that evil wolf at bay.